In a previous post, we discussed the idea of substituting green peaches to replace the ume fruit traditionally used to make umeboshi. Not too many folks have an ume tree growing in their yard, but they might have access to an apricot tree or a peach tree. A few Japanese-specific grocers may sell fresh ume fruit in June, but again, this proves to be an exceptional find and is most likely not organic. When David and I lived in Kansas City, I ordered three ume trees from a nursery in Washington. The Midwest is actually not conducive to growing ume, but in my youthful enthusiasm, I planted them regardless. The trees will live, but very rarely do they bear fruit. Late frosts, common to the region, freeze the blossoms and consequently, no fruit will be produced that year. I found a good rule of thumb before planting an ume tree is to find out whether apricots grow locally, since apricots are the closest relative to ume. Also check with your Agricultural Extension Service concerning the growing success for apricots. Much to my chagrin, I discovered that in Kansas City, apricot trees bear fruit once every 7 to 11 years! So much for growing and making my own umeboshi in Kansas! Perhaps though, if I had been more creative, I could have made “peach-boshi”. Here in California, our ume tree blooms in January. Our peach tree blooms later in the spring. 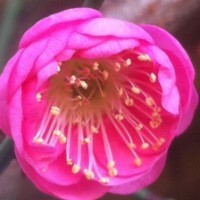 It has never failed to produce fruit, but even here, the ume blossoms sometimes receive frost. Often the ume blossom time here corresponds with many solid days of rain, making it impossible for the bees to get out and pollinate. Due to my love of summer peaches, it seems a little sacrilegious to pick all the peaches green. So I plan to pick some of the peaches while they are still green to make “peach-boshi”, and leave the rest to mature and ripen. Then I can enjoy “peach-boshi” and fresh sweet peaches, too! Another necessary component in making umeboshi or “peach-boshi” is an herb called shiso. 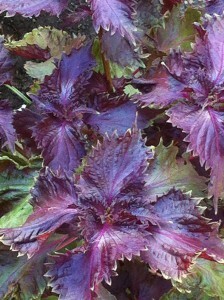 Shiso is also known as perilla or beefsteak. The purple shiso is the variety used to impart the red color to umeboshi. Shiso is very rich in iron and calcium. It also boasts anti-bacterial properties. Traditionally, fresh shiso leaves are served as a garnish with sushi containing raw fish, as it protects against fish poisoning, just in case the fish is tainted. Shiso is easy to grow your own shiso in any climate. Seeds can be ordered online. Once you establish a patch of shiso, it reseeds itself and will return year after year. Plant in the spring and it will be ready to harvest in August. The peach is my all-time favorite fruit. I’m sure this is the result of childhood memories of climbing the peach tree with my Missouri farm cousin and picking only the ripest, juiciest, red-cheekiest, sun-warm peaches right off the tree. We delighted in the heavenly stickiness dripping from our mouths and down our elbows as it stuck a day’s worth of summer play dirt to our shirts. To even think of picking peaches while still hard and green would never have entered my mind back then. But recently I spied small green peaches lacing the boughs of an abandoned peach tree. Valiantly, the tree had survived neglect and drought and yet still generously offered the kindness of fruit. Undersized from lack of water, at first I thought the small green fruits might be unripe apricots. But no, the apricots had already come and gone. I remembered Mr. Muramoto, author of ‘Healing Ourselves’ had creatively substituted apricots, for lack of ume, and created what he called “apri-boshi”. “Hmm…why not try green peaches?” I thought. And so this experiment has begun. 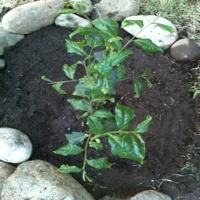 Sunday, May 18, 2014 , we planted our first tea bush in hopes that some day we can make our own kukicha “twig tea,” as well as green leaf tea. Our goal is to little by little attempt to make as many of the foods as we can that are usually imported for use in a traditional macrobiotic diet. Of course, it’s possible to have a macrobiotic diet without using twig tea, but we thought it would be fun and interesting, and more economical, to grow the tea that we personally like to use often. The tea bush pictured is one of five we will be planting to make a hedge that we hope will produce enough tea for us and our family. The variety we chose is the kind that is commonly cultivated in Japan. It produces smaller leaves and more stems. One of the benefits of twig tea that we appreciate the most is its alkaline support in the body. When properly prepared, the twigs release their minerals into the water, creating a mineral-rich alkaline brew. We make twig tea from the loose twigs, not from kukicha tea bags. The tea bags don’t release the same amount of minerals into the water, since simply steeping the tea bag in a cup of hot water doesn’t allow much of the twigs mineral content to be released. We prefer cooking the loose twigs for 15-20 minutes. Loose kukicha tea twigs can be purchased at many natural foods stores, or bought online. If the resulting tea seems too dark or too concentrated for you, simply add more water until it’s the color and dilution that you prefer. We hope you’ll come and visit us at the Macrobiotics America “Whole Way House” in Oroville, CA, to share a cup of tea with us! Umeboshi: In the Kitchen or Medicine Cabinet? 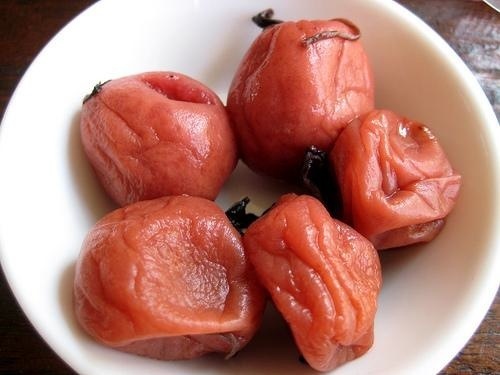 Umeboshi is useful in both the kitchen and in the medicine cabinet. This little wrink led salty and pickled fruit is a dynamo. In the kitchen its tangy flavor adds pizazz and zing to many dishes and dressings. In the medicine cabinet, it arm wrestles hangovers, diarrhea, the flu, headaches and upset stomachs. It is a mercenary for the ‘bad guy bacteria’ that make you sick, and at the same time a champion for the ‘good guy bacteria’ that keep your engine purring and your blood quality from running amok. If Eve had offered Adam an umeboshi instead of an apple, well, I think the history of mankind may have been decidedly different! A unique marriage, through the fermentation of a simple trio of ingredients, creates the health-giving properties of umeboshi. The star of the show is a small, often misunderstood fruit called ume (ooh-may). For starters, it was mistranslated along the way as “plum,” when actually its closest kin is the apricot. The skin is lightly fuzzy like an apricot, not smooth like a plum. It is harvested while still firm and green and is very sour, even when it is ripe. The second ingredient is purple shiso, a plant from the mint family with unique antiseptic properties. It is prepared and layered in the crock with the ume and gives the final umeboshi a natural reddish hue. Shiso is also known as ‘perilla’ or ‘beefsteak’. Shiso can combat food poisoning, viruses, colds, inflammation, indigestion and asthma, to name a few. The high quality sea salt is a key player as well, creating a sodium-balanced alkaline environment for ‘friendly’ bacteria to make a home and raise their families both in the crock and within your body when ingested. My thoughts returned to her story when I saw the little trees sprouting everywhere I had added compost. I hadn’t thought too much about it last fall, when I tossed the damaged or mashed umeboshi into the compost bin. These umeboshi had been sorted out three months after their entry in the pickle crock. (In the fall, the umeboshi are removed from the crock and spread out on baskets for three days to dry.) What a hearty little fruit! The life force housed within the pits survived composting and even three months of pickling. Cornellia was proven right. Another lesson is how Life, Nature, and Community are so beautifully integrated within the process of making homemade umeboshi. Most of us do not have the opportunity to share with others in harvesting and producing food as a group. The picking, cleaning, stemming and pickling of ume at the Vega Study Center, was a community affair, made easier and fun by everyone’s help. 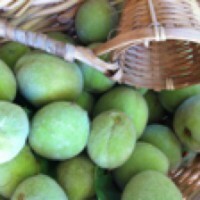 My favorite ‘ume time’ was harvesting the fruit. Imagine ladders, plenty of buckets, jokes and children playing tag in the orchard. Completing the task was cause for celebration with a picnic. Umeboshi are not difficult to make, as nature does most of the work, but since each ume must pass individually through human hands during numerous processes, many hands make lighter work. The initial process begins in June when the ume fruit is picked from the trees. Next a tiny stem must be removed from each piece of fruit. Then the ume is washed and soaked overnight. The following day, the ume is drained and dried in baskets before it is placed in the crock with layers of sea salt. In July, after the shiso is fully grown and harvested, the ume must once again be removed from the crock, drained and then layered with rubbed, salted shiso. Two to three months later, the crock is re-opened and the umeboshi is spread out on bamboo mats or baskets in a single layer to dry. For three days, each individual plum must be turned once per day and preferably brought in at night to avoid the dew. Finally it’s back to the crock where they can rest until pulled out for eating. The skin and flesh of each umeboshi is soft. If they are not handled gently and coaxed out of the crock, the umeboshi will tear. 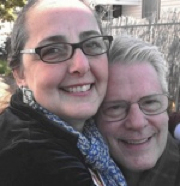 So you see, there is a great deal of care and attention that each individual ume receives. And now you can understand why umeboshi are not cheap at the store! For their contributions, I would like to give special thanks to my friend, Keiko Tokuda, for helping me move the heavy baskets of umeboshi upstairs from the basement and arrange the umeboshi on the mats to dry. I would also like to thank our friend, Meiko, for her generous supply of beautiful organic shiso from her garden, essential to the making of these umeboshi. These good memories and their generous spirit flavors these umeboshi. Many people ask if they can study umeboshi-making with me, but unless you live nearby it would be difficult, because the entire umeboshi process takes place in stages over many months. But I am starting production of a “How To Make Umeboshi” video. This way students all over the world will be able to learn. 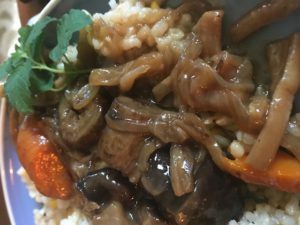 This fall, I will offer an advanced course in traditional macrobiotic homemade foods. 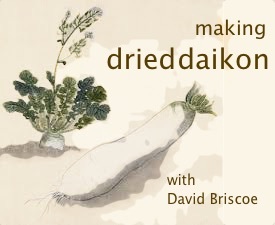 You can come and learn hands-on how to make white miso, tempeh, natto, amasake, seitan (wheat meat), takuan (daikon rice bran pickles), steamed rice bread, ohagi, tekka, shiguri miso, and many other gems of the traditional macrobiotic kitchen that are usually bought in stores, if they are available, at very a high price. But they are not as hard to make as you might think, and they taste so much better than anything you can buy. Making these products at home can be something you make for your family to enjoy, can save you money or could even turn into a shared group event and celebration. UPDATE: The current supply of homemade umeboshi is completely sold out. The next crop will be available in 2011.